Fig. 1: ICRI Guideline No. 310.2R and Concrete Surface Profile (CSP) replica chips. All photos courtesy of the International Concrete Repair Institute. The International Concrete Repair Institute (ICRI) Guideline No. 310.2R-2013, Selecting and Specifying Concrete Surface Preparation for Sealers, Coatings, Polymer Overlays, and Concrete Repair, has been specifically written to aid contractors and specifiers to adequately choose proper methods to mechanically prepare concrete surfaces prior to coating or repair. 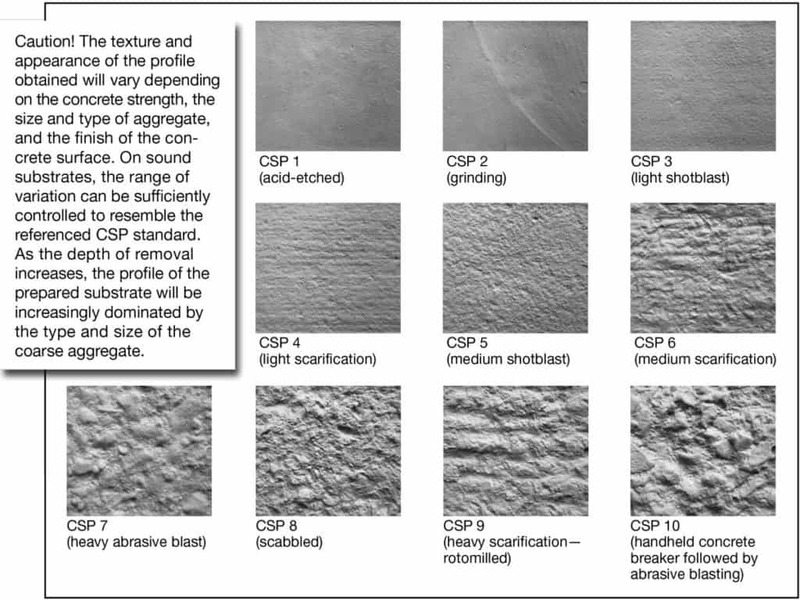 The guideline identifies 10 different concrete surface profiles (CSP 1-10), and CSP replica chips are available for use in visually accepting or rejecting a prepared concrete substrate (Fig. 1). (4.8 mm) in 10′ (3 m) or 1/8″ (3.2 mm) in a 6′ (1.8 m) radius. If the concrete slab is not within these tolerances, you will need to prepare your concrete slab to obtain such tolerances. Areas that are out of plane and not within the necessary tolerances can be repaired by utilizing a self-leveling underlayment placed over the slab. Most self-leveling underlayments will require a CSP 2 to 4, which can be achieved by mechanical preparation. Low areas within the center or edges of the slab, such as gouges or birdbaths, can be repaired with a patching or skim coating material depending on the depth of the repair needed, and these types of products may only require a CSP 1 to 2. Other than the flatness of the concrete slab, the moisture level in the concrete can also be a concern for the proper installation of hardwood flooring. Wood flooring adhesives are formulated for dry or wet areas, the difference being that a “dry area” adhesive can handle approximately 3 lb/1,000 ft2 (1.4 kg/93 m2) or 75 percent relative humidity (RH) of moisture vapor emitting from the concrete slab, and a “wet area” adhesive can accommodate higher values. Proper moisture testing, such as ASTM F1869 for measuring moisture emissions (lb/1,000 ft2 [kg/93 m2]) or ASTM F2170 for measuring the relative humidity (percent) within the concrete slab, is useful in determining which type of adhesive needs to be used with your wood flooring or if a moisture mitigation system will be needed prior to leveling the floor. Slab moisture testing should be conducted by a trained professional who is certified to perform the testing and accurately report reliable test results. The ICRI “Concrete Slab Moisture Testing Technician (CSMTT)” certification program trains and certifies individuals to properly perform slab moisture testing and report consistent, accurate, and reliable test results that will help the owner, specifier, and contractor make informed decisions as to when a concrete slab is ready for a floor covering installation. During placement of a new construction, slab on grade, it started raining. Unprepared, the contractor finished the slab and left it alone. Previously in the article, it was stated that concrete has to be flat and dense to receive hardwood flooring. Typically, when excessive moisture, such as rain, occurs during the placement or finishing process of concrete, both flatness and density may be compromised. A client has a commercial building that is very old. The concrete slab has been maintained well and has had other flooring material installed for years. The client now wants to install hardwood flooring and give his office a new look. Although modern building codes require vapor barriers to be placed under concrete slabs on grade, these can fail over time and were not required decades ago. Failure is caused by subbase material penetrating the barrier, roots, or damage during placement of the concrete. This can lead to unknown excessive moisture, especially if the original floor covering is breathable and did not show any signs of moisture issues. Proper acknowledgment of these concerns will aid in fewer issues at a later date. A concrete slab was placed with two or three concrete finishers working at the same time. Not knowing what the final flooring would be in areas of the building, the concrete was finished out of tolerance for a flat slab. The owners and designer will not change flooring options due to this mistake, and no one wants to tear out and replace the slab. Finishing errors can occur on concrete placements. Identifying these errors prior to installation of the flooring is the ideal scenario to remedy before the flooring is installed. A combination of methods and materials may be required due to intermittent finishing errors. These are only a few scenarios of how the ICRI’s guideline could be utilized on your next hardwood flooring installation. 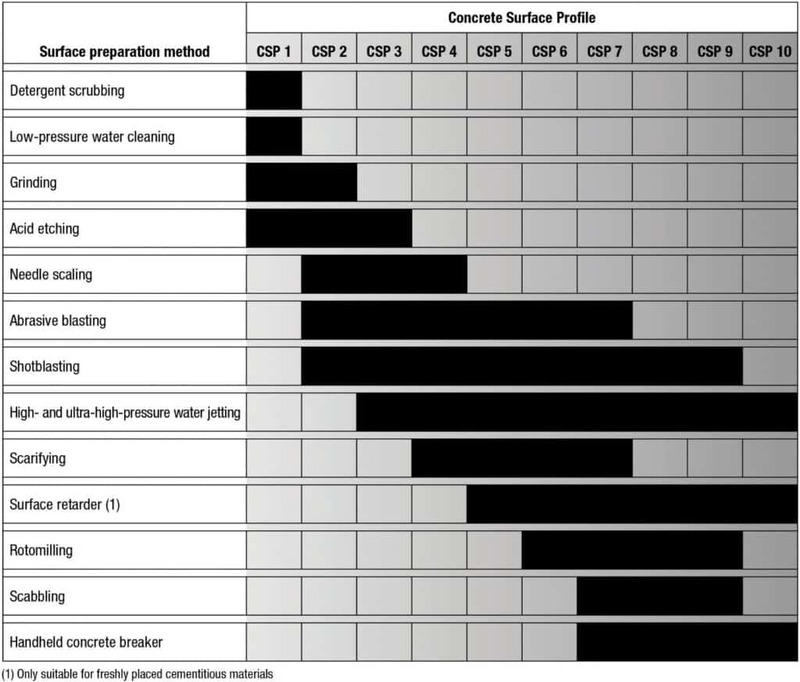 Within the guideline, recommendations for CSP range by the material to be installed as well as surface preparation methods that can achieve these profiles are provided (Fig. 2). The guide also touches on jobsite requirements that normally may be overlooked, including vibration, noise, environmental/safety factors, equipment details and limitations (no one wants to show up with a 48″ [121.9 cm] wide shot blast machine only to find out the doorway opening is 32″ [81.3 cm]), and more. Fig. 2: Preparation Methods Selection Table. Most concrete repair material manufacturers have adopted the use of Guideline No. 310.2R-2013 on their product data sheets. Consult your material supplier to find the adequate products to achieve flatness, and to remedy unleveled areas or areas with moisture concerns, on your next project. 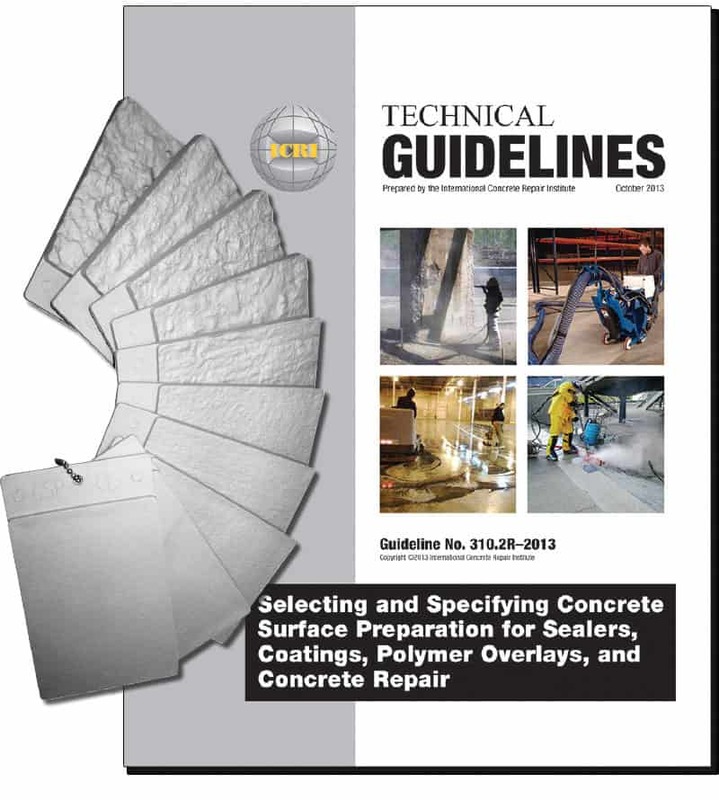 If you are interested in obtaining a copy of the International Concrete Repair Institute (ICRI) document Guideline No. 310.2R-2013, Selecting and Specifying Concrete Surface Preparation for Sealers, Coatings, Polymer Overlays, and Concrete Repair; the CSP replica chips; or information regarding the “Concrete Slab Moisture Testing Technician (CSMTT)” certification program, visit icri.org. 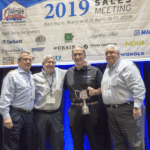 Andrew Fulkerson is Technical Manager – CRS for MAPEI Corporation in Deerfield, Florida. He can be reached at afulkerson@mapei.com. 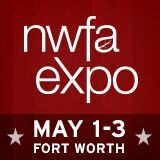 Prev Tech Talk: What Was the Most Unique Subfloor Prep Situation You’ve Encountered and How Did You Handle it?